Combats the effects of stress, tiredness and pollution. 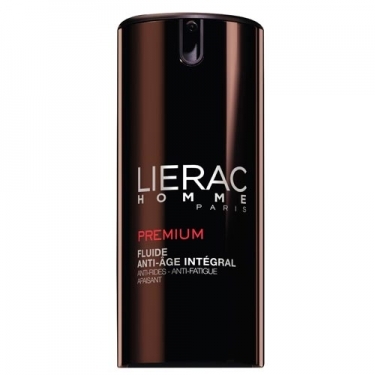 DESCRIPTION: Homme Premium Fluide Anti-Âge Intégral from Lierac is a cream intended for anti-aging anti-wrinkle treatment for the skin of man. Coming from the latest scientific advances, this high-tech care and multiations, combines the best of Lierac research, to provide a global response to the problems of aging skin (wrinkles, ridges, loss of firmness), fatigue and irritation. With Mineral Complex Skinpowers (Magnesium, Iron, Copper, Zinc and Manganese), Hyaluronic Acid for smoother skin and toning and revitalizing action of Guarana, Taurine and Caffeine. Not greasy and not sticky. Non-comedogenic. Apply daily, morning and evening, on clean and dry skin.